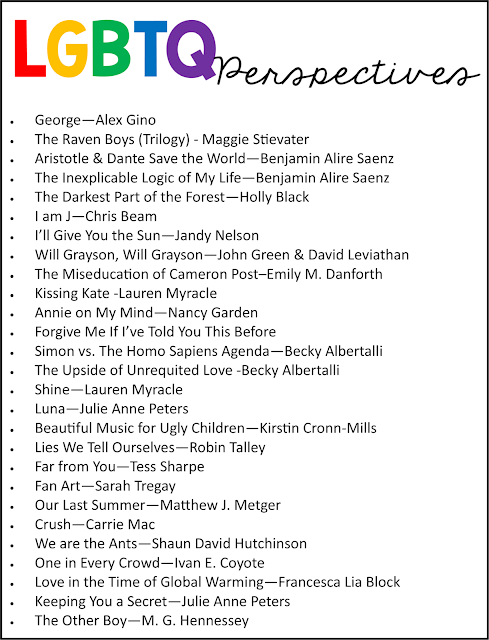 An an ELA teacher I want my students to read books from as many perspectives as possible... 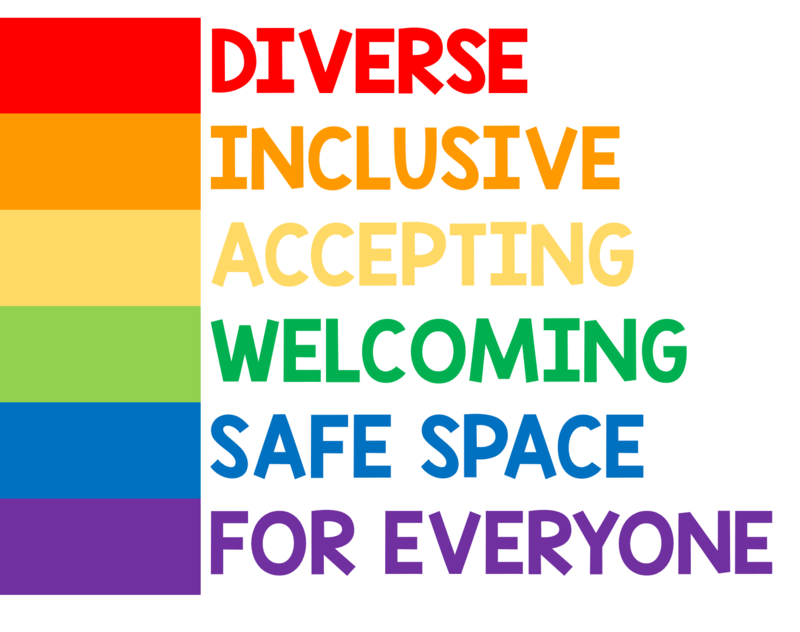 I want all my students to feel represented and heard in my classroom. As much as I may think I do a good job of this already, it's something I really want to focus on in the coming months and years... and it's something I know I can improve upon. One of the first perspectives I wanted to highlight was literature with an LGBTQ+ focus... books with characters and issues that students struggling with the own sexual orientation or gender identity could relate to. 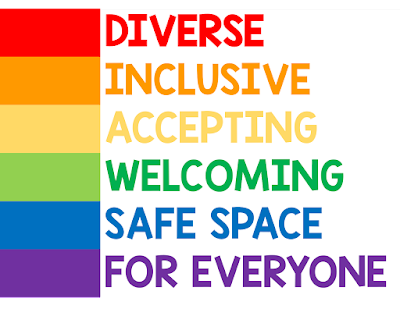 I also wanted to ensure that my students knew I was accepting of them all... no matter how they identify. 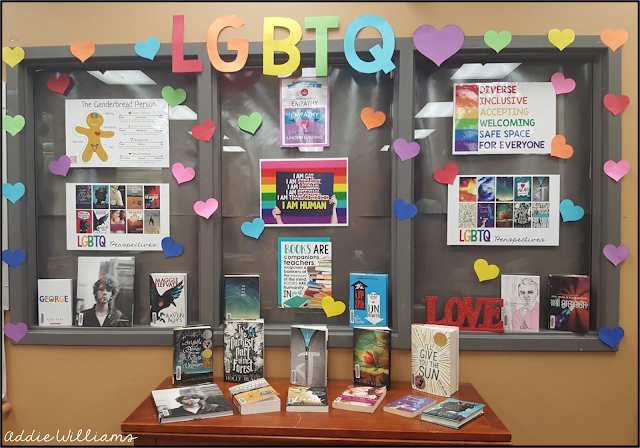 So, after seeing a post from The SuperHero Teacher on Instagram and reading her blog post on the Secondary English Coffee Shop Blog about building a diverse classroom library, I knew I had to make a display for my school library to promote acceptance and promote the literature. I wanted to showcase some of my books, I wanted to show struggling students that I was an ally and I wanted to promote acceptance. The students at school have been great - lots of really positive comments and a few quiet chats with students to pass on their gratitude. AND... students have been borrowing the books!! If you'd like to create your own display or your own library I'll link to a few of the items I used in the display and give you a list of some of the books I have in our library. There are many versions of this poster available on-line for easy download. I have it posted on the door of my room and in the display. 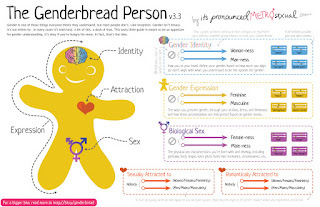 The Genderbread Person is a fantastic resource from It's Pronounced Metrosexual - it's amazing visual to show students the vast spectrum of people. Check out their website for more resources, links to books / articles and to download your own copy of this poster. The purple empathy poster in the middle is also available for download on the same website. 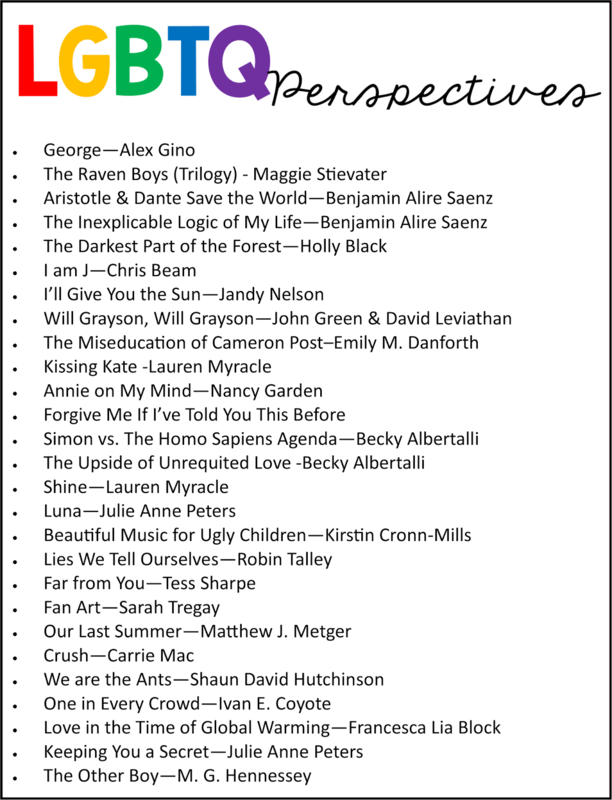 Here's a list of the books we have in our school library that feature an LGBTQ perspective. Full disclosure - I have only read a few! I'm slowly making my way through the list - would love to know if you have any favorites for me to add!! You can also check out a list from AbeBooks and from Goodreads. 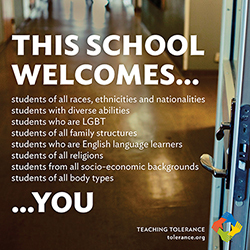 I also love this poster available at TeachingTolerance.Org and the accompanying blog post - download a full version of the poster HERE. I hope you find some inspiration in this blog post! I'm so excited to be part of the incredible SCIENCE TEACHERS of Teachers Pay Teachers and this amazing Back to School Giveway! 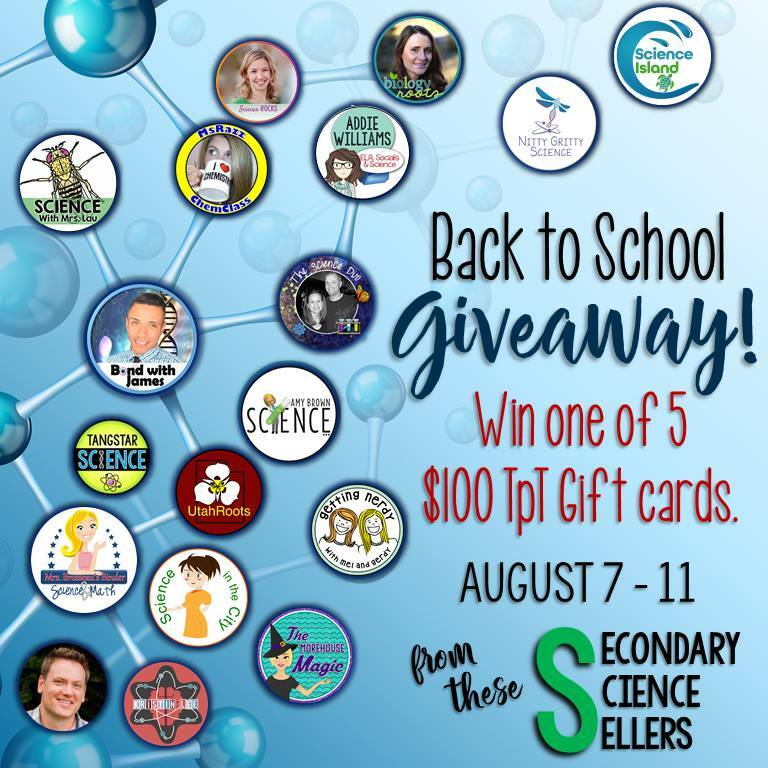 Enter below to WIN ONE OF FIVE $100 gift certificates to TpT! Keep reading to see how to enter! 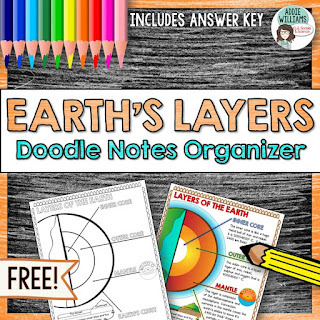 As a thanks for stopping by, be sure to head over to my TpT store to grab a FREE copy of my Earth's Layers Doodle Notes - great for review or as a study guide! Be sure to visit all of the great blogs listed below to get all of the words to complete the sentence. Best of luck to you all! Giveaway ends August 11th, 2017 at 11:59 PM EST. Open to Residents of the US only. Winners will be selected at random and be notified by email. Winners have 48 hours to confirm their email addresses and respond before a new winner is selected. The product offered for the giveaway is free of charge, no purchase necessary. My opinions are my own and were not influenced by any form of compensation. Facebook, Twitter, Pinterest, and Instagram are in no way associated with this giveaway. By providing your information in this form, you are providing your information to me and me alone. I do not share or sell information and will use any information only for the purpose of contacting the winner. Every year I can't believe how quickly time has flown by... it seems like just yesterday I was getting ready for a new year with new students, new ideas and new curriculum. Here are some of the things I do to help make it through the chaotic last month or two of school. I go through all of my piles (I seem to have sooo many piles!!) and sort them into three categories. Then (and this is key for me!) - I deal with all three piles right away! I SHRED all important documents that don't need to be kept... I march out to our recycling station and RECYCLE my pile of papers into the bin... and then I file all of the papers that I need to KEEP. I know this may seem a little (or a lot crazy!)... but if I've got time, I like to get as prepared as possible for next year. Where I teach in British Columbia, Canada we don't get any paid prep time at the start of the year. We can go into school early to set up our classrooms, organize our curriculum, photocopy papers etc... but it's all done on our own time. However, we do have a few days in June to prep for next year and I take full advantage of them to do what I can. It helps make my summer a little more enjoyable. I spend some time with my students asking them to reflect on their school year and who helped them along the way. I think it's important for students to spend a few minutes writing a thank you note to a teacher or staff member in our building thanking them for support, assistance, encouragement or help during the year. I provide a 'thank-you' note template photocopied on to colored paper - I let them choose the color and the template. About half of my students want to deliver the note themselves, the other half ask me to do it. I don't grade their letters, I don't read their letters... it's all up to the students what they want to say. My coworkers LOVE to receive the notes and it's fun to watch how excited my students are to share them. Grab a FREE copy of the templates and lesson plan and get started today! Lastly, I try to find student activities that are low prep for me, engaging for the students and don't require any grading (or very little). Here are some of my favorite activities to help you get through the last few weeks of the year! Click each image below to check them out! I hope you have a fantastic summer!! It's been a tough start to the year for my students and I have never seen so many kids struggle with time management and school stress. I am hopeful that the Winter Break will give them a chance to recharge and refocus in the new year. However, I know they will need a helping hand once we get back to school in January. 1. 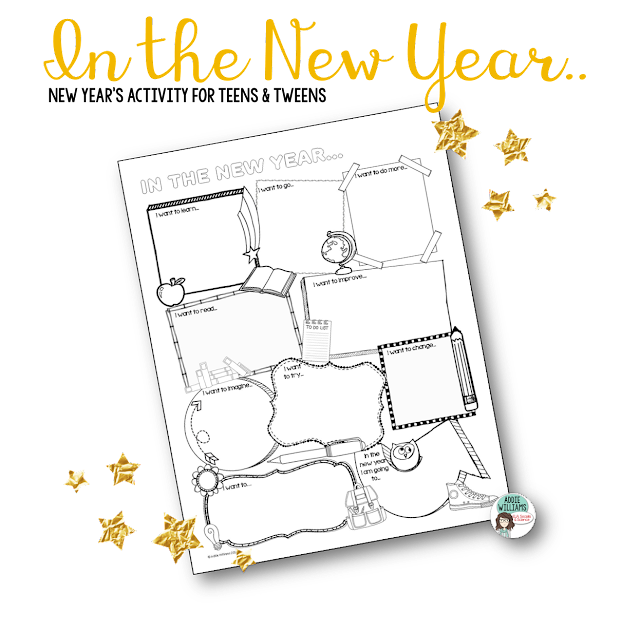 Start off the year with a fun goal setting activity. I know the first day back after a break is hectic and busy - my students want to visit and chat with friends they have not seen and share their highs and lows of their time off. I always spend some time talking about what we all did over the break and sharing some laughs. And I always spend some time with an easy and engaging activity. Grab a FREE copy here of the goal setting worksheet I use with my students. I like to allow them time to work on it on their own and then give them time to share with each other. Finally I ask everyone in the class to share one or two of their goals - they can pick which ones and how many. I always share one or two with them too! 2. When we start back in January, we have 6 months left of school in my district. It's a long slog to Spring Break in mid-March and then another long slog to the end of June. So I like to lay out my plan for the remainder of the year. I give my students a calendar for January / February printed on colourful paper - there are lots of free ones available online - and we fill it out together. I let them write in our holidays, professional days and other important school dates (report cards, parent-teacher etc). I also outline what units we're going to tackle and when we're going to get to them. I keep the calendars posted in my classroom as a reminder of what's coming up. Click HERE to grab a fun printable calendar or HERE for a more standard calendar. 4. If you have not done so already, the new year is also a great time to change up your seating plan. Depending on my students, I have assigned seating that I change up every so often... and the new year is one of those times. If I can, I even change up my desk arrangement in my class. It's a fresh start, a new perspective, a new neighbor to chat with and a different view of the room. I also change out some of my posters and try to make my room look fresh and new. It's amazing what a little refresh does for everyone's mood! 5. Reflect on what you have already done together as a class or last year! Not only do I like to look forward, but it's fun to look back and come up with the highlights of the previous year. 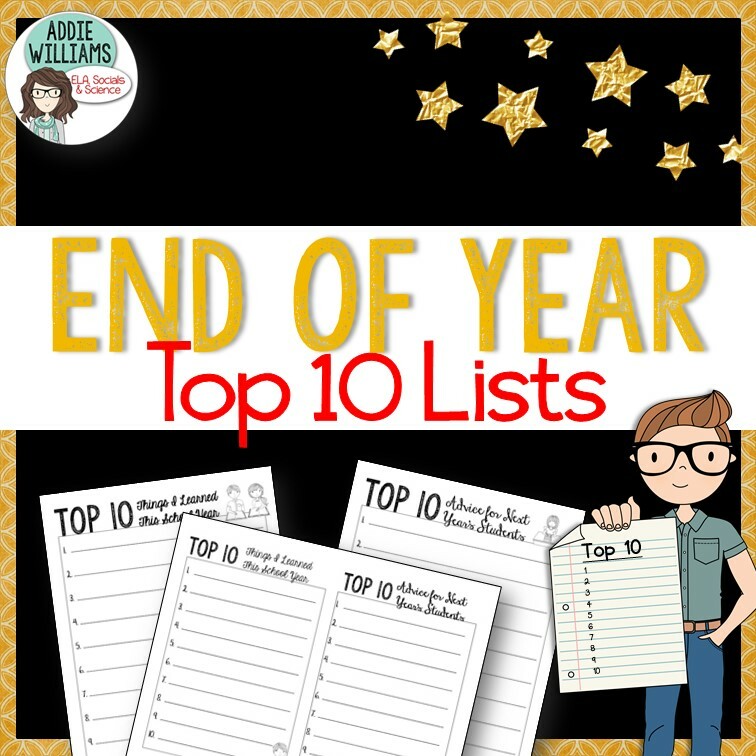 There are a ton of Top Lists for each year - why not show a few related to your subject of study and see if students agree. Here are a few -Top Teen Books, Science Stories, Sportsperson of the Year, and there are many, many, more! Have your students create their own Top 10 Lists - here's a link an activity I use in my classroom every year and my students always enjoy it! 6. 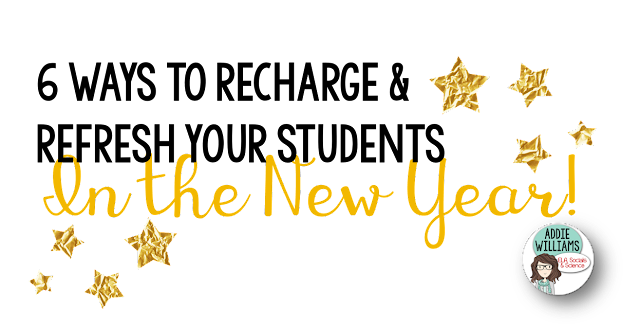 Lastly, I like to start off the new year with an honest conversation about work habits, study skills and the importance of staying organized. "It's easier to keep up, than catch up" is written on my whiteboard and it seems many of my students need a reminder! I know the importance of reviewing study techniques, organizational skills and handing out a new assignment log (see my blog post HERE on The Secondary English Teacher Blog about helping students stay organized). I ask students to set a homework plan for themselves and remind them that the calendars I pass out, their planners and their phone apps can help them manage their time. I'd love to know what you do to set your students on a good path when you get back from a long break! What's your best lesson? Is it also your favourite? What part of ELA do you enjoy teaching the most? It seems that I say every unit is my favourite on the day I introduce it to my students! It's hard to pick... and my enthusiasm knows no bounds. I'm thrilled to be linking up with some awesome ELA teachers to learn more about their favourite or best lesson ideas - we can learn so much from each other! Thanks to Secondary Sara for putting this all together and organizing us! I love teaching English and in particular I love to teach students how to enjoy and improve their writing. I know that writing can be challenging for students and it's frustrating to grade their essays and paragraphs and see the same errors over and over again. I also know it can be frustrating for students to constantly lose points for the same errors over and over again as well. Make it Fun - Students need to write and write often. The more they write and read other's writing the more comfortable they will be with the writing process. I try to make writing as fun as I can... I use engaging writing prompts at least once a week. Try using the writing prompt "Would You Rather?" Would you rather... live in a bathtub for a week or live on the couch? Would you rather be Scout or Jem? Would you rather eat a bowl of spiders or a bowl of ants? Relate your question to the novel you're reading, a holiday or just make up one that's guaranteed to get your students talking. Here's a link to a huge selection of FREE "Would You Rather?" question prompts on TeachersPayTeachers - I have used them with students from 5th-12th grade with great success! Show Your Students GOOD Writing - It's hard for students to see the errors in their writing... it's challenging for them to see where they are going wrong with their organization, their voice, and their structure... so showing them examples of what you're looking for can be very helpful. Mentor texts can be found online, can be examples of student work from previous years or examples from another teacher. Share the mentor texts with students, talk about them, read them, assess them with the same grading rubric you use. Many of my writing activities include mentor text for students and I ask them to assess the mentor texts using the same grading rubric I use. Peer Edit - I believe strongly in the power of Peer Editing. It allows students to share their writing with others and lets others see what their peers are capable of writing. Students will learn from each other and perhaps in providing feedback to others, will see how they can improve their own writing. To see how I run peer editing in my classroom, check out this blog post HERE. Like the mentor texts, I have students assess their peers using the same grading rubric I use to assess their writing. Direct the Writing Process - Students need to learn that there is a writing process and that there are steps to ensure writing success. From the first seeds of a brainstorm to the final edits, students need to be shown and guided and I love showing students their growth after they've followed the process. I require that all students complete all of the steps and I like to check in with them at every step of the way. If we're all working on the same prompt or topic I like to do a group brainstorm and have students share ideas with each other and the class. I might even provide a topic sentence/thesis to help get them on their way. Sometimes all the students need is a nudge in the right direction. I know how long it can take to grade student writing - it can take hours!!! But... the value in providing good feedback can't be overlooked... so I often will look over their rough drafts and spend most of my time on the first page.... it saves me time and I know that the remainder of their work will probably be similar. With good peer editing I am hopeful that students will avoid many of the more common writing errors. 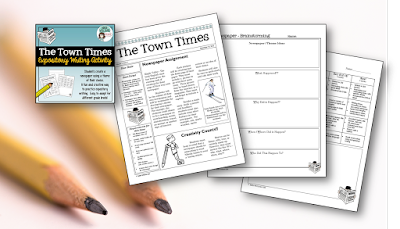 Check out my FREE Expository Writing Activity - The Town Times HERE for a look at how I organize a writing activity... it's a small sample of the writing activities included in the pack. 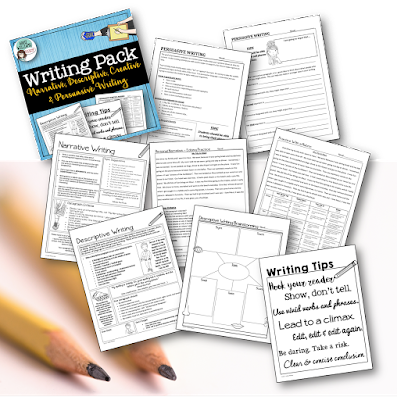 My most popular resource is my Writing Pack - it includes everything you need to guide students through Narrative, Persuasive, Descriptive and Expository Writing and includes all brainstorming, planning, editing and peer editing activities for writing success. I have manage to use these activities with students from 5th - 11th grade and have designed them all to be easily differentiated for varying ages and abilities. Over 50 pages of mentor texts, rubrics, planning pages and more! 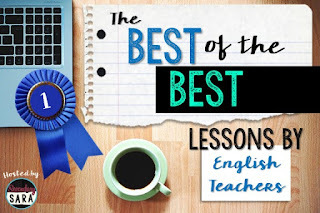 Be sure to check out everyone else's favourite lessons - I know I can't wait to see what everyone is sharing! As Remembrance Day draws near, it can be challenging for students to truly understand the impact that the World Wars had on Canadian families. I don't think I truly understood the enormity of it all until I stood in a World War II cemetery in Normandy, France. It wasn't until I stood and read the sweet messages of love that were carved into the gravestones that I could really appreciate the sacrifice of each of the young men. Although I don't have children of my own, I looked at the high school students I was with on a field trip and tried to imagine sending them off to war and then the heartbreak of finding out that they had died serving their country. The memory of that moment is etched in my mind forever... and I know that it sticks with my students as well. Although I can't take every student I teach on a field trip to the battlefields of Normandy I can share my own experiences and photos of my trip with them. If they say a photo is worth a 1000 words then I will share as many photos with my students as I can. Here is a resource I have used with my students over the years that I created using photos I took at various memorial sites in France. Combining the photos with quotes makes for a powerful writing exercise for students. 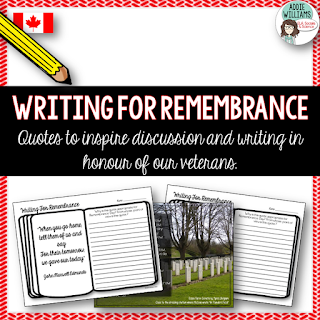 Click the image below to check out the Writing for Remembrance activity in my TpT store - it includes a PowerPoint of each photo with a quote and unique writing paper templates. Makes a great classroom or hallway display. There are also many emotional and powerful images available online that will help your students imagine what it was like to fight in years past or to be a member of the Canadian Forces now. The Canadian War Museum has an impressive collection of photos you can use as writing prompts in your classroom - click HERE to check out their WWI collection. For a different spin on things why not show your students examples of Canadian War Art and talk about the difference in seeing a photo versus a painting. Click HERE to see examples. Some questions to ask your students about the art could include - Why did artists feel it was important to capture the images of war? How does the use of color change your idea of the wars as most photos are black and white? Be sure to check out the official website (full of amazing resources) from Veterans Affairs Canada - they have an incredible library of resources. 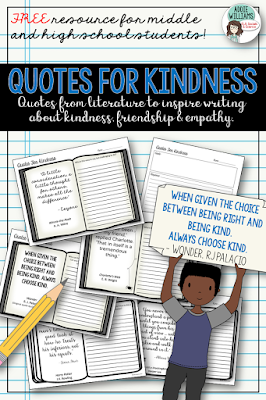 Be sure to download the annual poster for your classroom and bookmarks for your students. Highway of Heroes - Music by the Trews set to powerful images of our Canadian soldiers. A Pittance of Time - by Terry Kelly - song and video about taking time to remember. Would be great to use as a discussion start or journal prompt. I hope you and your students take a moment to pause and reflect about what Remembrance Day means to Canadians and the sacrifice that many have given. Be sure to check out the great posts from more Canadian bloggers - there are some amazing ideas to share. Big thanks to Two Peas and a Dog for organizing all of us!